An ideal Zero Waste Set for anyone wanting a plastic-free home. With 21% off the RRP! This Eco Gift Set is a great way to introduce a friend to plastic-free alternatives. 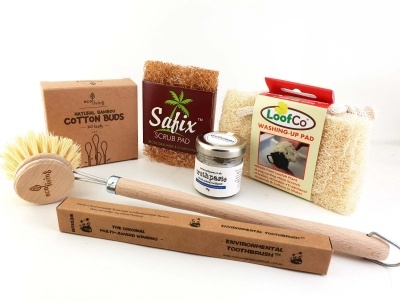 This eco set contains, 1 x Loofah plant cleaning pad, 1 x bamboo toothbrush, 1 x natural toothpaste, 1 x Safix coconut fibre Pad, 1 x Wooden Dish Brush, 1 x A pack of 100 bamboo cotton buds. An ideal zero waste starter set for anyone wanting a plastic-free home. With 21% off the RRP! This eco set is a great way to help a friend on their zero waste journey or introduce them to plastic-free alternatives. This set does not come gift wrapped to save on packaging. This set is 100% Vegan. 1 x Loofah washing up pad. Natural loofah plant washing up pad. Fits neatly into the hand and when it's immersed in water it swells up and becomes a spongy, flexible yet robust pad that will not scratch. It is ideal for washing dishes, cleaning work surfaces, chopping boards, baths, sinks, tiles & taps. It will last for months with normal use and as it is plastic-free, when worn out it can be composted. 1 x 40g of Natural Toothpaste in a reusable glass jar. truthpaste is a handmade natural toothpaste with Natural Clays, Aloe Vera, Neem, Myrrh, and Certified Organic essential oils. Suitable for vegans. It is free from fluoride, SLS /SLES, triclosan, glycerin and Palm Oil. It doesn't contain any foaming agents, bleaching agents, colourants, or artificial ingredients. truthpaste comes in a reusable and recyclable glass jar to help reduce the use of plastic toothpaste tubes. The flavour is Peppermint & Wintergreen. 1 x Wooden Dish Brush. A plastic-free dish brush, with plant bristles. The brush head is removable and replaceable. This brush is fully biodegradable and made from vegan and sustainable materials. A dish brush with plastic bristles can shed hairs that can end up in the ocean, the bristles on this brush are made of plants. FSC certified. 1 x Spare Replaceable Dish Brush Head. A plastic-free wooden dish brush head, with plant bristles. 1 x Safix Pad. A natural scouring pad made from 100% coconut fibre. Plastic-free and compostable at the end of its life. This does not release microplastics into our environment, unlike commercial scouring pads. 1 x A pack of 100 Bamboo Cotton Buds. Made of bamboo with a cotton tip, these buds are 100% biodegradable and compostable.